Good for your taste buds. Good for the planet. One reason that mushrooms are so special in the culinary world is because they contain compounds that deliver that satisfying ‘umami’ taste experience that is described as ‘rich, savory, brothy, meaty.’ Since first identified by a Japanese food scientist in the early 1900s, Umami is now universally recognized as one of the five tastes detectable by the tongue along with Bitterness, Sourness, Sweetness, and Saltiness. 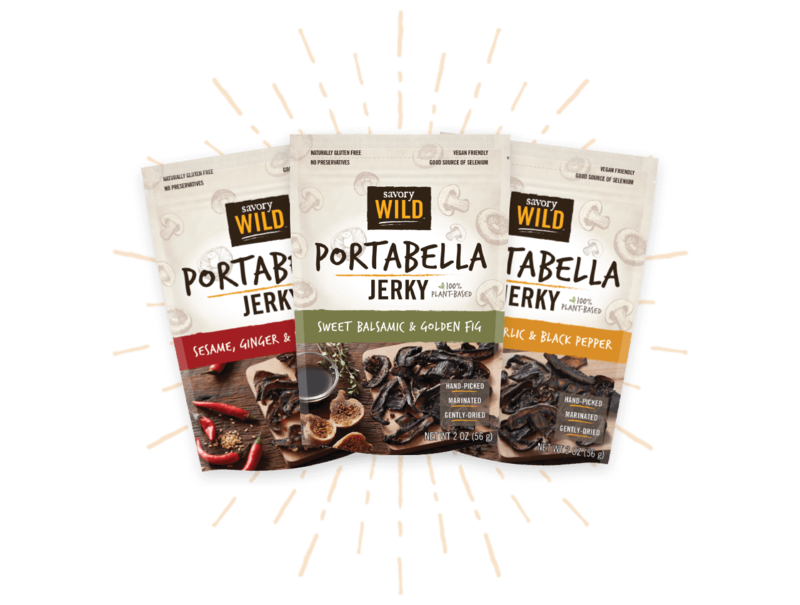 For health-conscious snackers who crave savory satisfaction but are avoiding processed meats, Savory Wild Portabella Jerky with its naturally rich and chewy texture is an excellent option. Mushrooms are often referred to as ‘nature’s superfood’ because they are both healthy on the plate and gentle on the planet. In the wild, Mushrooms serve a tremendous regenerative and symbiotic role in breaking down organic materials and transporting nutrients across their ecosystems. When cultivated for food production, Mushrooms are one of the most sustainable foods produced in terms of resources required and impact. For example, it takes just 1.8 gallons of water and 1 kWh to produce a pound of Mushrooms. They are grown indoors year-round from a compostable material, and the soil is recycled after harvest for multiple purposes including field replenishment and potting soil.